Urban creek chub like the one pictured have deeper bodies and are less streamlined than rural counterparts. Credit: Elizabeth Kern. A North Carolina State University study examining the effects of urbanization on the evolution of fish body shape produced both expected and surprising results: One fish species became more sleek in response to urbanization, while another species became deeper bodied in urban areas. Generally, urbanization produces conditions that make water in streams flow more variably and more quickly during rain storms. So NC State biologists hypothesized that fish would quickly evolve a body shape that improves swimming efficiency in response to changes in stream water velocity caused by urbanization. "We wanted to test rapid body shape evolution in western and central North Carolina stream fish in response to urbanization," said Brian Langerhans, associate professor of biology at NC State and senior author of a paper describing the research. "While some species cannot handle the altered conditions and have disappeared or reduced in abundance, some remaining species may rapidly evolve adaptive trait changes to contend with the human-induced changes in their environment." The study combined fieldwork in streams to document contemporary patterns across different fish species and regions in North Carolina; examination of museum specimens to track changes in fish body shape over time; and lab experiments to understand whether nature or nurture affect fish body shape changes. In the field, one species of fish, a type of minnow called western blacknose dace (Rhinichthys obtusus), reflected predicted changes: its body shape became more streamlined in urbanized areas. Langerhans said the body shape changes likely help make it better able to handle changing water conditions. Meanwhile, its body shape in more rural areas, regions largely devoid of urban influence, remained less sleek. 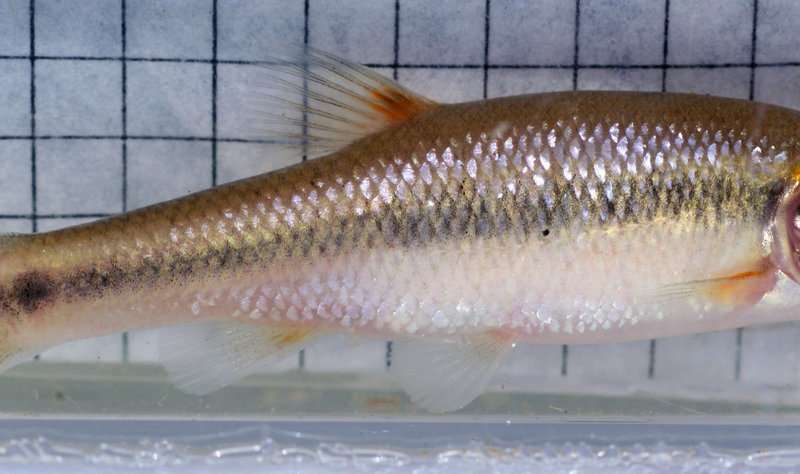 Yet the study also showed that a minnow cousin, the creek chub (Semotilus atromaculatus), actually became less sleek in more urbanized areas. Creek chub in rural areas remained at baseline shape, while those living in streams surrounded by large amounts of impervious surfaces like roads and sidewalks developed deeper bodies. "One species showed morphological changes that nicely matched evolutionary predictions of increased streamlining to better handle the altered conditions, but the other species showed a change that did not match our simple prediction, highlighting how different species can solve similar problems in different manners," Langerhans said. Museum specimens of rural and urban creek chub dating back half a century showed historical urban creek chub body shapes similar to those in modern urban areas: more boxy and less streamlined. Historically rural areas, meanwhile, had more sleek creek chub, similar to those observed in these streams today. However, in streams urbanized around 30 years ago, creek chub bodies changed over time from a sleek shape characteristic of rural streams toward deeper bodies characteristic of modern urban creek chub. Lab-raised creek chub showed nature had a bigger influence than nurture, as creek chub individuals from rural and urban areas raised in a common environment showed the same differences as modern-day field samples, with urban creek chub less streamlined than rural.